MFA and MA, author of Excavation: A Memoir, Hollywood Notebook, and the dreamoir Bruja. 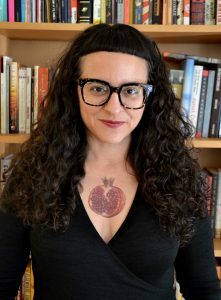 Ms. Ortiz’s work has been profiled or featured in the Los Angeles Times, The Rumpus, the Los Angeles Review of Books, and the National Book Critics Circle Small Press Spotlight blog. Her writing has appeared in The New York Times; Hazlitt, Vol. 1 Brooklyn; Joyland; and StoryQuarterly; and a year-long series appeared at McSweeney’s Internet Tendency. Ms. Ortiz works as a psychotherapist in private practice in Los Angeles. My approach to writing is to look at writing projects as a series of experiments. My approach to working with students is to help each writer discover their intentions in a piece, often through a series of questions that maintain an open and nonjudgmental curiosity. In discussing our intentions, our writing, and the writing of others, we can open ourselves up to experimentation and a rigorous inquiry into what we would like our writing to ultimately accomplish, breaking down the work into manageable steps, and eventually, risky creative leaps. It’s my belief that staying as close to the edge as possible is what makes some writing phenomenal. Together we can clarify intention, cultivate that edge, and develop writing practices and experiments that push our work to the next level.